With all the buzz around Steven Stamkos lighting it up this year, and his potential for 50 goals in 50 games, we’ve been thinking a lot about Wayne Gretzky. 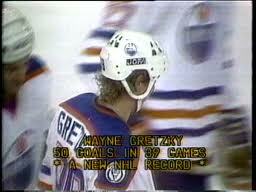 Not only because he said Stamkos could score 50 in 50, but also because Gretzky did it 39 games. Wayne is one of those players whose stats are so fun to go back and look at. He scored 215 points in 1985-86, was a +98 in 1984-1985, and had 10 consecutive 100+ point seasons - the guy was unbelievable. Perhaps one of his most popular stats and records is when he scored 50 goals in 39 games. Growing up, one of our favourite movies was Wayne Gretzky: Above and Beyond. It was a classic movie that we watched far too many times, but it never got old. One of the best parts in the movie is him discussing his 50 goals in 39 games. He mentions calling his father, Walter, who couldn’t watch the game because it wasn’t being televised in Ontario that night. Wayne told him the news of breaking the record, and received a jerky quip back from Walter: “Geez, what took you so long?” One of the amazing things about this record, is that in 37 games, he only had 41 goals. In his 38th game against the Los Angeles Kings, he scored 4 in a 10-3 rout. Three nights later on December 30th 1981, at the Northlands Coliseum, Gretzky would do the unthinkable that night: score 5 goals to reach 50 in 39 games. "He’s got 50 goals before anybody else got 30"
I had no idea he scored 4 goals the game before..thats insane, how come they don't mention that more... 9 goals in 2 games to get 50!